A hybrid system that uses an air source heat pump in conjunction with a furnace can increase efficiency. If you're in the market to improve the efficiency of your home's heating system, a hybrid system that uses an air source heat pump in conjunction with your existing furnace may be your best option. These systems can reduce your heating bills by as much as 30 percent. A heat pump condenses heat present in the outside air -- usually down to about 30-degrees Fahrenheit, depending on the region and the amount of moisture in the air -- and pumps it into the home. When the temperature drops below freezing, there's not enough heat in the air to sufficiently heat the home with the pump alone, so the backup electric or gas furnace kicks in to provide warmth. "Seventy-five to 80 percent of the heating season, the heat pump does the majority of the work," said Mike Wallace, owner of Star Heating and Cooling in Fishers. "Then, during the really cold months, the backup heat kind of takes over and assists the heat pump in heating the house." When the seasons change, the heat pump does, too. In warm months, the pump pulls heat out of the air in the home and discharges it outside, eliminating the need for an air conditioner. 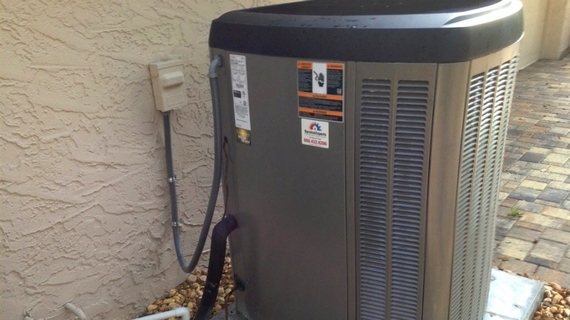 A heat pump typically costs about $800 to $1,500 more than a standard air conditioner. Rebates from local energy utilities and the potential monthly savings on your energy bill can also help offset the cost of a heat pump. According to a recent nationwide Angie's List poll, 31 percent of respondents plan to take advantage of the tax credits that expire this year to save money on their utility bills. "The complete cost of operational cost and installation pays for itself in the short term because you aren't burning fossil fuels and natural gas to heat your home," said Chris Cunningham, owner of Service Plus in Avon. Heat pumps have gotten a bad reputation in the past, Wallace said, because the air being pushed out isn't as warm as the air from an electric or gas furnace. "I don't necessarily recommend them to customers who like their house toasty warm, but what it lacks in the higher temperatures, it overcomes with (a) greater amount of airflow," Wallace said. "When you have both a heat pump and furnace together and it gets really cold outside, then the (backup furnace) will put out the warmer air. In that sense, the hybrid system is probably the preferred method of putting a heat pump in. You get the advantage of saving (energy) during the milder part of the heating season, then when it gets really cold, you get the comfort from the gas furnace when you really want it." To read more about furnace efficiency, heat pumps, and geothermal units read the original article Use a Heat Pump with Furnace for Best Efficiency here. This article originally ran on Angie's List and is part of a series on the topic of heating and air conditioning. For more information about Angie's List, visit AngiesList.com.